Broadening the Discussion About Enrollment in Hartford Region Magnet Schools: What is going on with state funding of magnet schools? Posted on September 26, 2018 October 25, 2018 Author Robert Cotto Jr. Source: CT Office of Policy and Management, 2017. Over the last several months, there has been an organized campaign to undermine school desegregation in Connecticut. Most recently, a lawsuit has been launched challenging desegregation standards used for enrollment in Connecticut’s magnet schools. While some of the debate is related to frustration by parents in navigating school choice in Hartford, other parts are being manufactured with partial assessments of story. While I’ll deal with the lottery, desegregation standards, and profit motives in a later post, I want to broaden the discussion right now to funding of enrollment. A focal point of the recent controversy has been the issue of the Regional School Choice Office lottery and the assignment of students to these schools to meet desegregation standards. For many, the Sheff v. O’Neill case and desegregation standards are the culprit for magnet schools not accepting more students for enrollment. This is not an completely accurate assessment. In addition to the student assignment process and desegregation standards, assigning more students to magnet schools also requires dealing with funding and tradeoffs in terms of enrollment, staffing, and use of facilities (e.g. school closures) that have not been given their due consideration. In this post, let’s talk about funding towards desegregation programs such as magnet schools. If the goal was to have more students in magnet schools, then that goal would have to be funded. But over the last year or two, funding for racially diverse magnet schools has been cut by the State Legislature and Governor. For example, the 2017 budget implementer cut funding to racially diverse magnet schools in the state overall by $2 million from ’17-’18 to ’18-’19 while increasing funding to racially isolated charter schools by over $6 million (mostly by expanding enrollment, not the per pupil funding amount). In addition, funds towards the Sheff settlement remained flat at $11 million. On the other hand, the the budget increased funds for the Open Choice program, which may help individual students. Yet, Open Choice financially helps suburban districts more than cities like Hartford, which rely on magnet schools to generate revenue. Source: CT General Assembly, Public Act 17-2, 2017. (6) For the fiscal year ending June 30, 2018, and within available appropriations, the department may limit payment to an interdistrict magnet school operator to an amount equal to the grant that such magnet school operator was eligible to receive based on the enrollment level of the interdistrict magnet school program on October 1, 2013, October 1, 2015, or October 1, 2016, whichever is lower. Approval of funding for enrollment above such enrollment level shall be prioritized by the department and subject to the commissioner’s approval, including increases in enrollment in an interdistrict magnet school program as a result of planned and approved new grade levels. Any interdistrict magnet school program operating less than full-time, but at least half-time, shall be eligible to receive a grant equal to sixty-five per cent of the grant amount determined pursuant to this subsection. What this means is a State cap on enrollment in magnet schools to only those experiencing enrollment increases through adding grades levels. Furthermore, any increases in funding for magnets are at the discretion of the commissioner. In part, this has resulted in cuts at magnet schools at CREC and in Hartford as costs rise in those districts. Cuts have also been made in non-magnet schools in these and other districts because magnet funds also assist in funding districts like Hartford in paying for all schools, including non-magnets. This makes the task of attracting a racially and economically diverse group of families to magnets or non-magnets even more difficult since suburban families or well-off Hartford families can simply decide to keep their kids in local suburban or private schools/programs instead of magnet and non-magnet schools facing deep cuts to staff or programming. 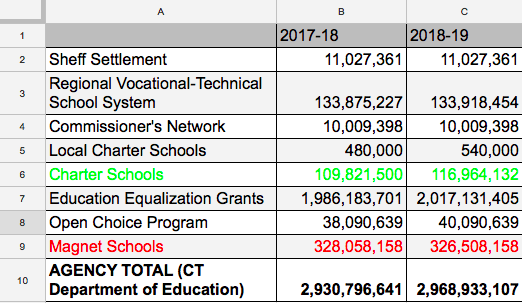 I’m not necessarily arguing for infinite increases on enrollment for magnet schools in Connecticut here. What I’m saying is that we must look beyond the lottery and desegregation standards when thinking about why magnet enrollment is flat or declining. At least part of the issue is the State has decided to put its money elsewhere such as charter schools and small increases to education cost sharing (e.g. equalization) grants for traditional school districts in 2018 & 2019, for example. Yet, those small increases were diminished by Legislative cuts in the 2018 revisions, particularly to education equalization grants, special education, and other funds. In sum, even if magnet schools were to add more students and meet their desegregation standards (and if this were desirable or without any additional consequences) there is no guarantee that the State would fund them more because the Legislature and Governor are not going to fund increases to the magnet school grants that also supplement district budgets. And the fallout is that Sheff plaintiffs and case gets much of the blame for flat enrollment at magnet schools, even though the State plays a major, if not, the most important role here. Indeed, it is the State of Connecticut that is supposed to affirmatively address racial segregation and reduce racial isolation caused by State policies in housing and schools. Have a question about school desegregation? Send it in the comments and maybe I’ll answer it!